Did you know that you can often tell what is wrong with a plant by looking at its leaves? ‘Reading the leaves’ to diagnose common plant ailments isn’t hard to do if you know what symptoms to look for. Problems such as iron or nitrogen deficiency are fairly easy to identify as is salt and sunburn damage. It’s hard to believe that we have made it through another summer. Oh, I realize that we have a few more weeks of 100+ degree weather, but whenever there is month that ends with the letters “ber” it just feels cooler to me. I am gearing up for my favorite season in the garden. In my last post, I talked about the reasons why fall is the best time to add new plants to the Southwest landscape. Today, I’d like to share with you three tips to help you make the most of your fall planting. This planting hole is too small. It all comes down to the hole. It’s hard to believe that often what determines a plant’s initial success is the size of the hole it is planted in. If you are digging holes like the one above – then you may be in trouble. That hole is too narrow. The ideal hole should be 3X as wide as the root ball. Well, most of a plant’s roots grow outward into the soil. When they are placed in a hole like the one above, the recently loosened soil makes it much easier for roots to grow into, which helps the plant to establish much sooner. *It’s important to note that the depth of the hole should be the same depth as the root ball or even a few inches shallower. This helps prevent problems from the dirt settling, which can leave your new plant sitting rather low in the soil where problems with becoming waterlogged can happen. The big question – whether to add soil amendments or not? When you go to your local nursery to buy new plants, you may be encouraged to buy soil amendments such as compost, potting soil or even manure. The question is, do you really need it? Often you don’t. I have planted thousands of plants throughout my career as a horticulturist and most of them without adding anything to the soil. The plants were healthy and did very well without any extra additions to the soil. Here a few guidelines to follow to help you decide whether or not to add any amendments to the soil before planting. – If your soil is well-drained AND your new plants are native to any of the desert regions of the United States, than the answer is “no”. Native plants are adapted to growing in the nutrient poor soils of the desert and do best when nothing is added to the soil. In fact, if the soil is too fertile – you’ll often see green growth, but flowering will be decreased. Valentine (Eremophila maculata), Feathery Cassia (Senna artemisoides) and Purple Trailing Lantana (Lantana montevidensis) planted without needing any soil amendments. The same can be said of some non-native plants – particularly those from Australia such as Eremophila and Senna species. So, are some times when adding soil amendments is a good idea? – If you have heavy clay soil or very sandy soils, than adding compost to the planting hole can help. Mixing compost in with clay soils help them to drain better. This is important because most plants that grow in the Southwest do best in well-drained soil. Conversely, sandy soils have a hard time holding onto enough water, so compost helps those soils to hold onto more water. Add 1 part compost to 1 part native soil and mix together before planting. – Amend the soil when planting non-native plants that do not originate from arid climates. Plants like day lilies, iris, roses, etc. require fertile soil to grow their best. Amending the soil with compost, manure and other amendments will improve the soil texture, add small levels of nutrients and add beneficial microorganisms which will benefit your plants. Plants such as these will need regular applications of fertilizer to do their best. Personally, I like to grow what I like to call ‘fuss-free’ plants where I don’t have to add fertilizer with the exception of my roses. Skip the fertilizer for newly planted plants. This tip is NOT always popular with some nurseries who often encourage the application of fertilizer at the time of planting. So, let’s talk about when to add fertilizer. – Most native plants will not need fertilizer ever. In fact, many can make their own fertilizer. – For plants that do need fertilizer such as hibiscus, iris, roses, etc. – wait until you see new growth occurring before adding fertilizer. The reason for this is that when you first add a new plant, it needs to concentrate on growing new roots in order to support future top growth (stems, branches and leaves). If you add fertilizer at the time of planting, you are forcing the plant to focus on the top growth before it has the roots to support it. So, a general rule is to wait until you see new top growth before adding fertilizer. – The rule for fruit trees is slightly different. It is recommended to wait until 1 year after planting before fertilizing. 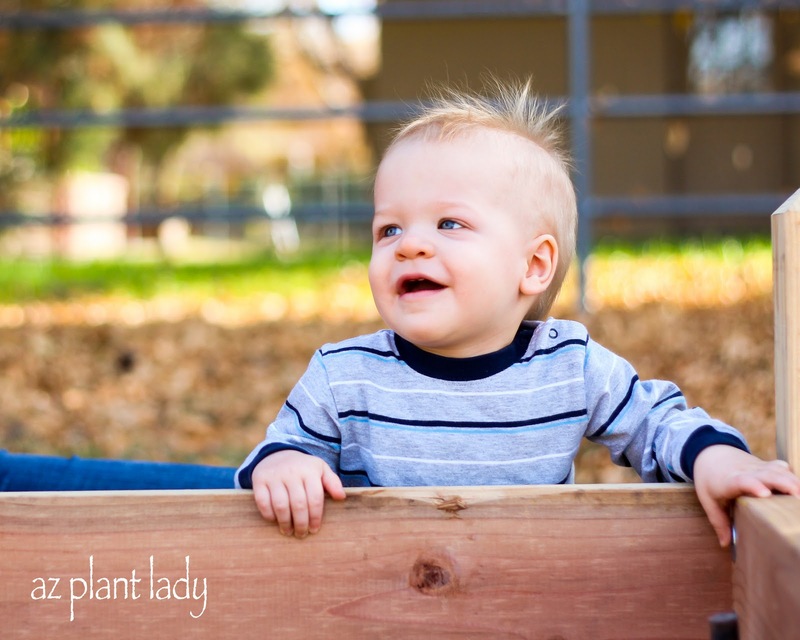 Again, you may hear differently from your nursery who in addition to wanting you to be happy with your purchase, also has their bottom line (profits) in mind. I am not including all nurseries or nursery professionals into this one group. However, I have visited nurseries where customers are told that they need to fertilize all their plants. Many of my clients are thrilled when I tell them to throw out their fertilizer because their native plants don’t need it. *I remember a story from one of my horticulture professors who talked about standing in line behind a customer at the store with a cart filled with native, desert plants and another cart with ‘special’ fertilizers that they were encouraged to buy. So, are you ready to add some new plants to your landscape? 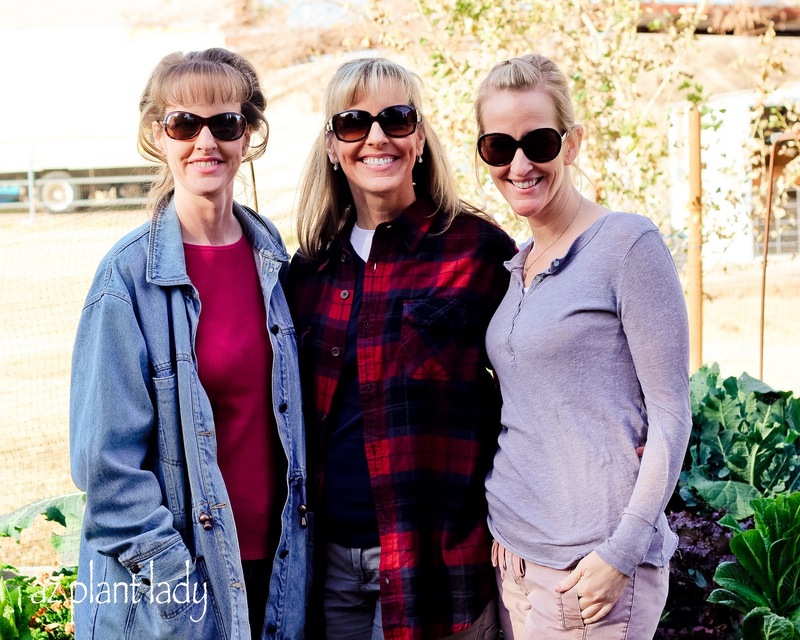 Before you head out to the nursery, I invite you to come back for my next post, when I’ll share with you some tips on how to select healthy plants AND I will reveal to you what my favorite plant nursery is! I apologize for the relative lack of recent posts. Life has been very busy with the kids back in school, increased landscape consults and getting ready to go visit my daughter, Rachele, who is expecting. We will find in a few days whether we will be welcoming a boy or girl! I have two biological children – both girls and my oldest daughter, Brittney, has a daughter. So, we will see if Rachele will break the pink trend in our family. Which Soil Amendments Do You Need? Using soil amendments is one of the best ways to grow healthy flowers and vegetables. There are different types of soil amendments that act in different ways. In order to help explain which soil amendments to use in your garden – I was to do a “How-To” video about the subject. I hope you find it helpful. https://www.azplantlady.com/wp-content/uploads/2012/05/Omni-Compost.jpg 480 640 arizonaplantlady@gmail.com http://www.azplantlady.com/wp-content/uploads/2018/10/favicon.png arizonaplantlady@gmail.com2012-05-29 17:32:002016-10-26 14:36:26Which Soil Amendments Do You Need? New Vegetable Garden Finally Finished! Isn’t it true that most projects take longer then you plan on? Still, I always approach projects with optimism that I will be able to finish in just a couple of days. Of course, things just seem to come up with the kids and work. I get really busy this time of year when people’s gardens are starting to grow again. But finally, our new vegetable garden is finished! We added compost and manure to the existing soil (1/4 compost, 1/4 manure and 1/2 native soil) and mixed them together. I finished it off by adding bone and blood meal, which are natural sources of phosphorus and nitrogen that will release slowly over time. You can simply add a mixture of compost and manure to your raised bed and no native soil if you desire. This is easier, but I feel that working the soil down to a depth of 8 inches, helps with the growth of root vegetables. 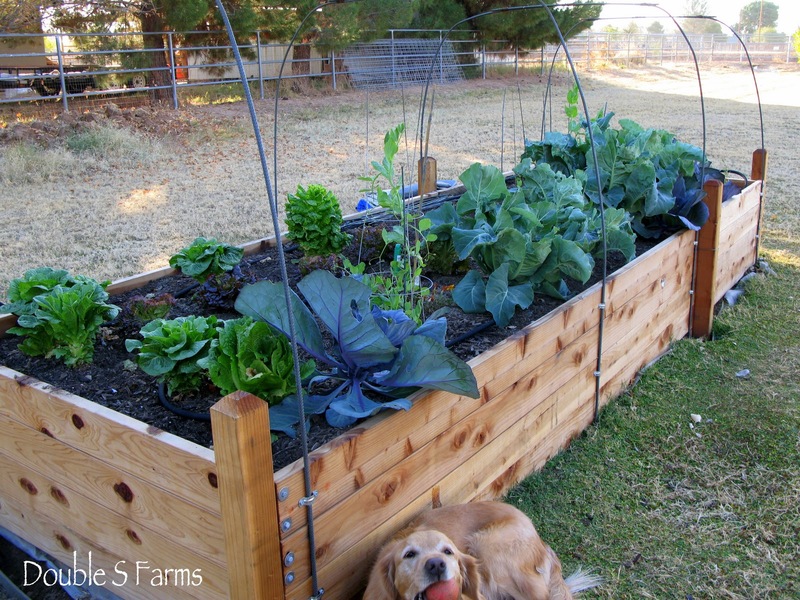 My husband built fences for the raised bed because we have dogs and they don’t always stay out of the garden. That and they love carrots. We bought 6′ fence planks and then cut them in half. A 3 ft. high fence is enough to keep them out. The fence planks were attached at the top using a narrow strip of wood. The base for the garden is made from a 2″ wide, 10″ high and this piece was 12 ft long. We used pine wood for our garden. Pine won’t last forever, but it will last for a few years and is relatively inexpensive. Of course, you can use cedar, which will last a very long time, but it can be rather expensive. **There is some controversy regarding using pressure treated wood for vegetable gardens because of the chemicals used in the process and whether or not they ‘leach’ into the soil. My husband built a removable gate into the garden without using any hinges or latches. As you can see, this removable gate has a narrow strip of wood on the inside and the other strip is on the top of the other side. The gate slides down into the opening with the bottom strip of wood, resting on the raised bed on the inside and the outer wooden strip on the top fits on the outside. You can see how the gate fits, above. We all had fun putting the sides up…it took three of us – two to hold the sides up while my husband attached the brackets. The entire time we were putting up the sides, we were visited by a curious and hungry Anna’s hummingbird. He would stop by every 5 minutes or so. I planted sweet corn, bush beans and cucumbers in my new garden in addition to marigolds, nasturtium and bachelor’s button, which will attract pollinators and help keep harmful insects away. https://www.azplantlady.com/wp-content/uploads/2012/03/3208.jpg 480 640 arizonaplantlady@gmail.com http://www.azplantlady.com/wp-content/uploads/2018/10/favicon.png arizonaplantlady@gmail.com2012-03-01 14:31:002016-10-26 14:36:28New Vegetable Garden Finally Finished! I’ve got a large pile of dirt outside my kitchen window. But, we are making progress on our new vegetable garden. Today, we amended the existing soil with equal amounts of compost and aged steer manure. Then added bone and blood meal, which are natural sources of phosphorus and nitrogen. Here are pictures of what we did today. (Not super exciting, but we are getting there). (If you’re looking for some new tools for gardening click here). Four of my favorite things….my husband, daughter, dogs Missy & Tobey and compost! Sprinkling bone meal (Beware of dogs digging afterward – they love the smell of bone and blood meal). Everyone joins into to mix the compost, manure, bone and blood meal with the existing soil. Isn’t it interesting how fresh dirt attracts both dogs and little boys? Our next step is to put up the sides and fence. Then we will rake the soil smooth and get the irrigation ready. I can’t wait to plant seeds! I must admit that I didn’t do much of the work today in the vegetable garden. I was busy preparing dinner for Sunday night, which is my daughter Ruthie’s 14th birthday party. I made my special ‘Baked Spaghetti’ with onions, garlic, tomato sauce, sausage, green peppers, herbs and of course – spaghetti. I had to make 3 batches to feed everyone. Our extended family is coming over along with Ruthie’s friend. I kept the kitchen window open so that I could watch their progress while I was cooking. I don’t keep a screen on my kitchen window since I have a hummingbird feeder in front of the window and I like to take pictures without the screen in the way. I did get a visit today from a female Anna’s hummingbird. She was 3 feet away from me while I stood at the kitchen sink. I am so thankful that she didn’t fly in the house. I’m so excited for this 3-day weekend. In my last post, I undoubtedly left you hanging, wondering how the second part of our project ended (just kidding). What project is that? Well, my siblings and I along with our families surprised my mother for her 70th birthday by building her a raised vegetable garden to go along with her existing one. I posted the first part of our project, which ended up with a lot of muddy shoes as we dug out the grass. You can catch up on the first part here. Now we all gathered again the next Saturday and were excited to finish the project. We worked on building up the remaining sides. It helped that my brother-in-law had a portable table saw, (if you don’t have one you can always have the store do it for you). Almost finished with the sides! My mother put out a blanket for the twins to play on and then the other grandkids came to play with them too. Once we got all the sides up, we lined the bottom with newspaper, which helps to supress weeds and will break down. My sister takes the twins, Danny and Dean for a walk around the backyard. Here I am with my two sisters. Okay, enough with all the family photos, let’s get back to finishing the garden. I don’t think that there is anything quite as wonderful to a gardener then a trailer full of compost, do you? One of the clients that I write for wants gardening ‘action’ shots, so I try to get them whenever I can. I love the fragrance of compost or as I like to call it “black gold”. My niece Sofie (left), and my kids Ruthie and Kai had fun spreading the compost inside. They kept getting higher and higher up as the garden filled up with compost. We finished the project by connecting the garden to drip irrigation and also put up support for the shade structure. The supports are made out of rebar. Two pieces form each support and they were bent by hand and fastened in the middle using wire. The support is used for shade cloth in summer, frost cloth in winter and bird netting all year to keep the chickens out of the garden. My mother was so excited about her new garden and she fed us all a fabulous lunch that day. 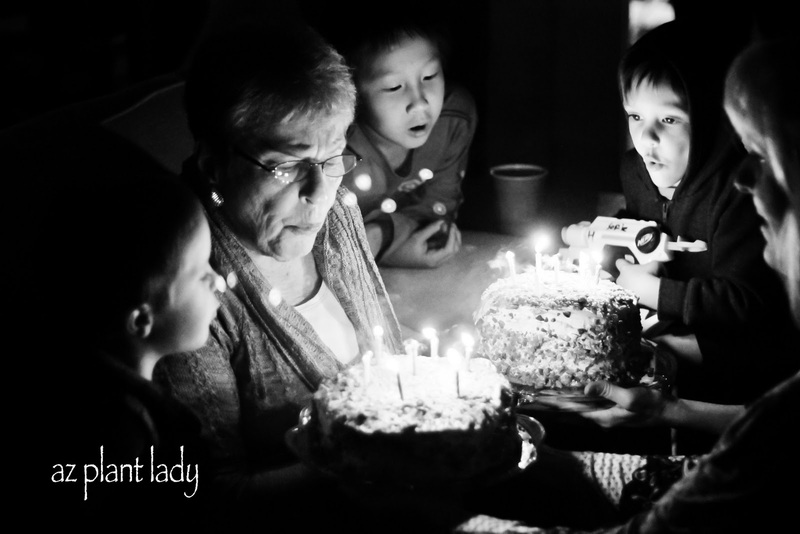 Later, we celebrated her 70th birthday with two cakes….